“Easy Pump System” results from the perfect combination of experience and technical application; it is a system that makes handy, efficient and fast the connection between PVC riser pipes and submersible pump. 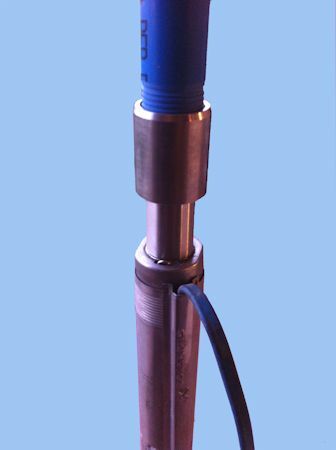 The EASY PUMP SYSTEM makes use of a PVC pipe supplied with a previously installed PVC sleeve at one edge and an inox threaded joint - especially for the submersible pump - at the other edge. If the riser pipe connection is larger or smaller than the pump thread, the inox joint can be adjusted at both sides as it can be supplied with one thread that fits that of the riser pipe and the other that fits the pump thread. Up to the ground surface the rest of the riser pipes are threaded with one PVC sleeve previously installed at one edge. The real innovation of these products, however, is the “SYSTEMBLOCK”: the sleeves and joints with SYSTEMBLOCK are equipped with an insert that prevent them from loosing or unscrewing further to vibrations, torsions, and pump frequent switching on and off. The systemblock is supplied from riser pipes diam. 75 up to those diam. 225 mm, whereas the pipes diam. 48 and 60 mm have sleeves and joints without systemblock because the power of the pumps that can be connected to such small pipes does not require this kind of system. In this case the rub gasket (o’ ring) that is inside the sleeves and joints tightens when screwing the pipes and offers enough resistance to bear small pumps pull (such as the pumps that can be connected to pipes diam. 48 and 60 mm). 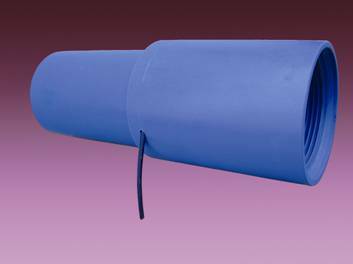 All the PVC sleeves are supplied in total with two rub gaskets that assure them the wet seal. PVC riser pipes are a good alternative to galvanized, inox and polyethylene riser pipes. They are made of high quality rigid PVC which have physical and chemical features that assure the maximum collapse resistance and tensile strength to the pipes. The strict crush tests carried out on the PVC bars produced no damage or buckling on them. Inside the pipes walls are completely smooth and they do not reduce. The features of the row material make these products light, easy to handle and resistant to corrosion and stray currents. The pipes have a very good hydraulic index (K = 0, 01) that results in minimum fluid loss and lower pumping costs. Download the technical data sheet in PDF format.